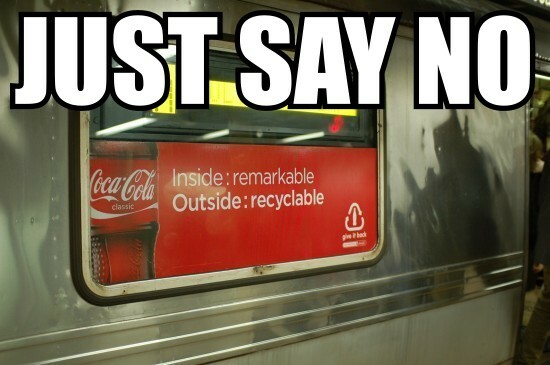 This is in response to your most recent e-mail to New York City Transit regarding advertisements on subway car windows. We regret any inconvenience. Please be assured that we have forwarded your comments to supervision in our Department of Subways for their review. If you have other transit-related concerns, you may call Customer Services at (718) 330-3322, Monday through Friday, 9:00 a.m. to 5:00 p.m. or write to NYCT Customer Services, New York City Transit, 2 Broadway, Room A11.146, New York, NY 10004. I’m in! My complaint will now be sent on to the next level of review, and hopefully in 4 to 6 weeks I’ll receive a response worth sharing with all you. In the meantime, I encourage everyone to email the MTA, like I did, and make your voices heard on this issue. NO WINDOW ADS! This entry was posted on Thursday, December 11th, 2008 at 1:23 am	and is filed under safety, subway. You can follow any responses to this entry through the RSS 2.0 feed. You can leave a response, or trackback from your own site. I guess no response in those “4-6 weeks”?? ?